The Hard Rock Hotel and Casino is an entertainment resort owned and operated by Brookfield Asset Management and Warner Gaming, LLC.. The property is located on 16.7 acres (6.8 ha) on the corner of Harmon and Paradise Road, inside the Paradise Corridor. Features of the property include the hotel tower, a 30,000-square-foot (2,800 m2) casino, Tahitian-style beach and swimming pool, a nightclub, five restaurants, three cocktail lounges, several retail stores, a spa, a poker room, and “The Joint”, a music venue. Hard Rock earns only about 30% of its revenue from gaming, probably the lowest percentage of any major resort in the Las Vegas strip region. Number of Rooms: Between the Hard Rock Hotel and the new HRH Towers there are 1,500 rooms. Casino: Yes, 30,000 square feet. Casino games include Blackjack, Craps, Let It Ride, Pai Gow Poker, Roulette, Slots, Baccarat and Megabucks. The Poker Lounge has a full bar and lounge, private VIP rooms, bottle service, iPod stations and big screen televisions. There also is a poolside casino area with swim-up Blackjack. Race & Sports Book: Yes, a 60-seat race and sports book, equipped with 28 televisions and two big screens. Entertainment: The Joint, live music venue that features the hottest and brightest acts of today, tomorrow and yesterday including world renowned DJ Tiësto. Nightlife: Center Bar is in the Hard Rock and Vanity is located in the HRH Towers. Pool: Yes, a 4.8-acre pool area with three distinct pools. The hotel features the Hard Rock Hotel Beach Club, and during the summer months, the Sunday pool party Rehab. Spa: Yes, Reliquary Spa in HRH Towers offers multiple types of massages and services. Shops: Hart & Huntington Tattoo, John Varvatos, Affliction, Love Jones lingerie boutique, Sundries, Fuel, Rocks – The Jeweler and Hard Rock Retail Store. Wedding Services: No, but wedding services are available on property. Yes, 60,000 square feet of event space including a 6,000-square-foot conference center. Also, penthouses are available for private functions, and private dinner parties are available in all rooms. In-Room Internet Access: Yes. Internet Wi-Fi service also is available in your hotel room for a fee. Hotel Amenities: Concierge, luggage service, maid service, safety deposit boxes, wake-up calls and room service. Parking Garage: Yes, two parking garages. Valet parking also available. Standard Room Amenities: Air conditioning, alarm clock, radio, remote-controlled 42-inch plasma TVs, On-command movies, mini bar, desk, electronic door locks, hair dryer, telephone and voice mail. Policies: Children 11 and under stay free with an adult. The maximum total number of guests (adults and children) in a room is four. No alcohol from off-property sources is permitted in guest rooms. 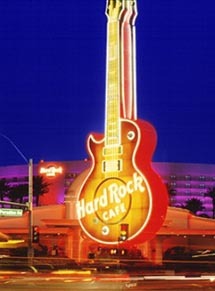 Incidental Charges: The Hard Rock Hotel requires a credit card at check-in to cover incidental charges. When you check in, the hotel will place a hold on your credit card equivalent to $100 per day for your entire stay. For example, if you are staying for three days, a $300 hold will be placed on your credit card to cover incidentals. The Hard Rock Hotel charges a $18 per room, per night resort fee which covers the cost of valet parking, internet access, shuttle service to and from the Strip, daily access to the Rock Gym and Fitness Center, local and long distance telephone calls, covered self parking and pool towels. This fee is not included in your reservation and will be charged at the hotel. The resort fee listed above does not include tax. Some resorts also apply room tax to their resort fee.